Jean-Baptiste Monnoyer (12 January 1636 – 20 February 1699) was a Franco-Flemish painter who specialised in flower pieces. He was attached to the Gobelins tapestry workshops and the Beauvais tapestry workshops, where he produced cartoons of fruit and flowers for the tapestry-weavers, and at Beauvais was one of three painters who collaborated to produce cartoons for the suite The Emperor of China. He was born at Lille and educated in Antwerp. He was in Paris by 1655 and elected Academician. He was documented working on the decors of the Hôtel Lambert. He was taken up by Charles Le Brun for decorative painting at the Château de Marlyand at the Grand Dauphin's residence, the Château de Meudon. ... He was received at the Académie Royale de Peinture et de Sculpture in 1665 with a piece of the genre that he made his specialty, a still life of flowers and fruit combined with objets d'art. 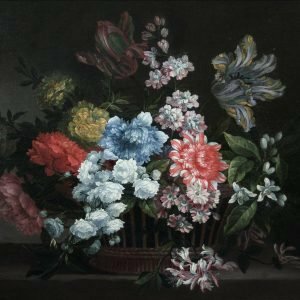 His only appearance at the Paris salon was in 1673, when four paintings of flowers were exhibited by "M. Baptiste". 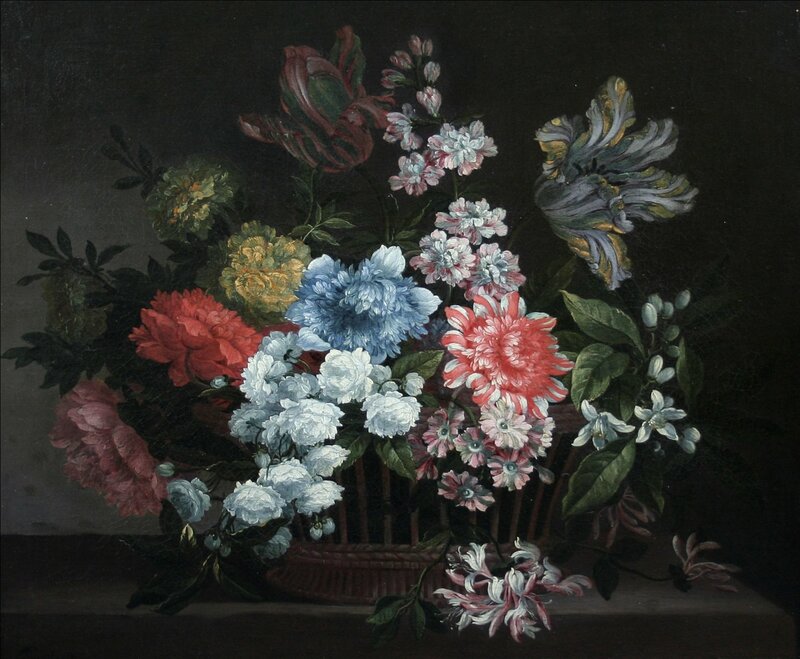 In 1690 he left France for England, to work on painting decorations for Montagu House, Bloomsbury, London, where he produced over fifty panels of fruit and flowers for overmantels and overdoors, some of which have survived at Boughton House,Northamptonshire, for the first Duke of Montague, the then Ambassador to Louis XIV of France. Jean-Baptiste Monnoyer died in London in 1699. Monnoyer was buried in St. James's, Piccadilly in 1699. Monnoyer’s work is well represented in a number of notable museum and gallery collections all over the world, including The Hermitage in St Petersburg, The Louvre in Paris, The Metropolitan Museum of Art in New York, The Museum of Fine Arts in Boston, The Fitzwilliam Museum in Cambridge and The Royal Collection in London.